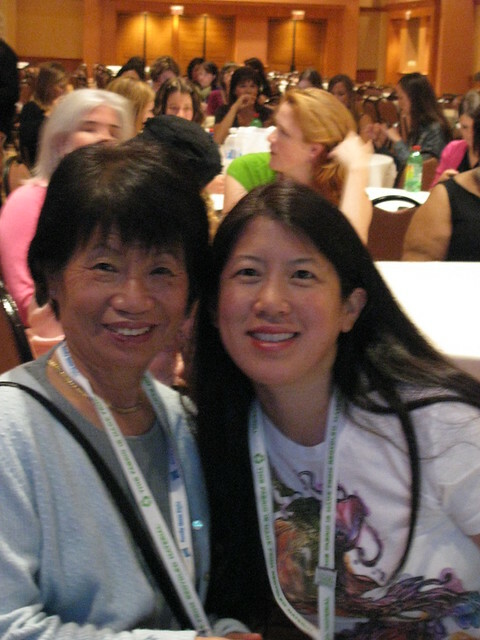 For the third year in a row, my mom has joined me at BlogHer. It's our way of getting together without the craziness of grandkids. In 2009, I was mortified and then relieved when she took the mic during my session on mommy blogging balance. Last year, we rocked her home town of New York together. This year, we flew to lovely San Diego, where she knew the lay of the land having stayed at the Marriott Marquis for several conferences previously. 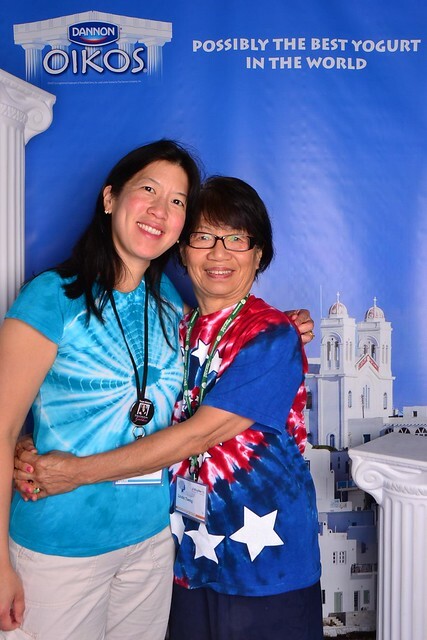 This year presented tons of great photo opportunities where we didn't have to shoot with a long extended arm. Here we are with the California Raisin. 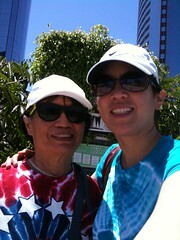 And before indulging in Dannon Oikos yogurt. I was actually confused to see the Oikos brand name on a Dannon product, where I've seen it always on my beloved Stonyfield, but this link explains the partnership. 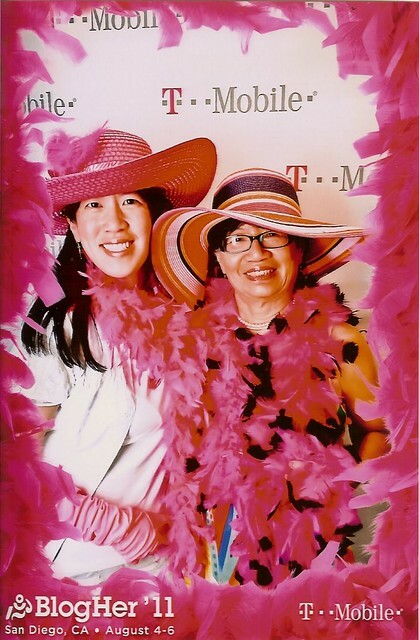 And from the cool blue of Greece, we dressed up in hot pink boas for T-Mobile. 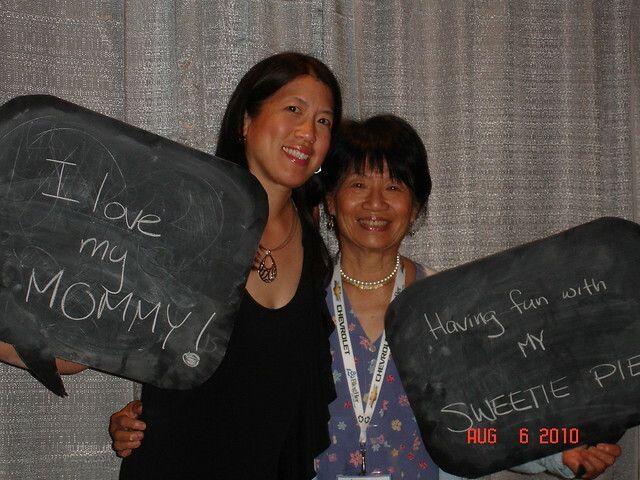 Since BlogHer will be in New York again next year, you can be sure to see the dynamic duo again next year! How fun! I hope to go, too, in 2012. You went to Tijuana?? Cool. We thought about doing that, but chickened out and ran out of time. Awesome! Looks like you two had a great time. 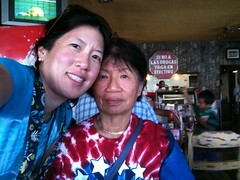 It was fun for me to watch you shoping a flashy hand bag and Dova's dress at Tijuana. That photo of "pink mom" is too pink! I wonder if I could edit it to make it less pink. I'm glad y'all had fun, and I'm glad I got to run into both of you! !